Helen J. Zeh age 81 who resided in Klondike passed away Friday April 12 with her family by her side. Helen was born April 11, 1938 in Glen Flora, Wisconsin to the late Forrest and Pearl (Offner) Angell. She married Roy H. Zeh on November 9, 1957 in Neenah. The couple moved to Klondike where they farmed for many years. Helen grew up in a large family, being one of fourteen children, and she knew hard work from day one. She learned to cook at a very young age, and helped her mother take care of her younger siblings. 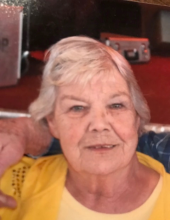 She worked as a candy striper and also as a grocery clerk for a small town grocery store, until she met the love of her life, and forever best friend, Roy, who lovingly called her “Toots,” a nickname given to her since her childhood. Together, they started a beautiful life, farming, and raising their five children. Helen enjoyed gardening, and always put in big gardens on the farm, canning, and cooking, not only for her family, but often feeding hired help as well. She enjoyed cutting the lawn on hot summer days, and building on her great tan. Even the cows loved Helen, as she always spoke sweetly to them when she milked them. All of these things she did while taking care of her family. Toots and Roy rarely spent a day apart from one another, and had the love story that we all dream of having. She will forever be loved and missed. Survivors include her husband of 62 years, Roy, and their 5 children, Dawn Podoski (David), Paula Seewald (Larry), Steve Zeh (Misty), Carol Zeh (Dean), Michelle Kittredge (Jesse), 14 grandchildren, Heidi Auer (Jeff), Jill Podoski (Nate) Jesse Seewald (Emily), Mandy Ruechel (Matt), Sara Schimming (Derek), Ashley Zeh, Tyler Zeh (Abby), Miranda Delzer (Peter), April Garrett (Justin), Hannah Morrissey (Hanns), Elizabeth Morrissey, Lily Morrissey, Jake Kittredge (Whitney), Gabrielle Kittredge (Jake), 13 great grandchildren, Mykaela Podoski, Jake Barrette, Kayden Antone, Mattie Ruechel, Jack Auer, Jace Auer, Idries and Nour Morrissey, Francesca Seewald, Eli Ruechel, Bodie Zeh, Josslyn and Jaxon Schimming. She is one of 14 siblings Charles Angell-Deceased (Bonnie) George Angell-deceased ( Betty) Donald-Angell-deceased ( Bonnie-deceased) MaryLou Blanchette- deceased, William Angell (Juanita) Oregon, Robert Angell-deceased (Sandy) Elizabeth Angell-deceased (Myron-deceased) Dannie Angell (Nancy) Kaukauna, Karen Angell, Neenah, Lanny Angell-decease (Patty), James Angell (Gail-deceased) Pound, Judy Bradley (Roger) Tennessee, Pam Zielinski (Terry) Neenah. The family will greet relatives and friends Wednesday, April 17, at Rhodes Charapata Funeral Home in Coleman, with visitation from 9:00 AM. until time of Funeral Service at 11:00 AM, with Pastor Mark Kostreva officiating. Burial will be at Oak Hill Cemetery in Neenah. To send flowers or a remembrance gift to the family of Helen Joyce Zeh, please visit our Tribute Store. "Email Address" would like to share the life celebration of Helen Joyce Zeh. Click on the "link" to go to share a favorite memory or leave a condolence message for the family.